In his Apostolic Letter Salvifici Doloris (“On the Christian Meaning of Human Suffering”), Blessed Pope John Paul II wrote: “The theme of suffering… is a universal theme that accompanies man at every point on earth: in a certain sense it co-exists with him in the world, and thus demands to be constantly reconsidered.” We all know that suffering is a common experience; we have each of us suffered in some way in our lives, we know others who have suffered and we are also, thanks to the media, acutely conscious of widespread suffering throughout the world. As John Paul II put it: “in whatever form it takes, suffering seems to be, and is, inseparable from man’s earthly existence.… man walks in one manner or another on the long path of suffering.” It is on this “path of suffering” that medicine meets man, and it is the nature of this meeting which is our present topic of discussion. At the outset of this discussion, and in order to keep in mind the depth of the question before us, it is worthwhile asking the question: “What exactly issuffering?” We might speak of it in terms of pain, whether that is physical, emotional, psychological, spiritual, or social, and we might discuss pain in terms of neurotransmitters and nerve pathways or emotions and feelings. Yet suffering seems to be something that encompasses all these experiences and reaches still deeper within us. In the Judeo-Christian tradition evil has always been understood as a lack, limitation, or distortion of good. In this way we can say that man suffers because of a good in which he does not share; for example, when we are sick we are suffering because we do not share in the good that is health. This truth is also reflected in the basic human response to suffering which is to try and alleviate it, to restore the good that is missing. Suffering is a scandal to us; it is something that we intuit should not be. Phrases we often hear in situations of suffering such as: “It is not fair...” or “She does not deserve this...” reflect our attempts to make sense of suffering, and it is this struggle that is particular to man’s experience of suffering. What makes suffering a human reality, we can say, is the fact that man knows he is suffering and wonders why. “Within each form of suffering endured by man... there inevitably arises the question: why? It is a question about the reason and the purpose of suffering, in brief a question about its meaning.”We suffer most intensely when we do not have an answer to this question. Suffering, then, provokes in us deep questions: Why am I suffering? Why is there evil in the world? Who am I? Behind which lie deeper questions still: What is man? Who is God? Does God even exist? And it is in virtue of these questions, particularly the question “why?”, that suffering becomes a place in which man reaches beyond himself, since in asking “why?” he is ultimately addressing God himself. As John Paul II wrote, “...what we express by the word ‘suffering’ seems to be particularly essential to the nature of man. Suffering seems to belong to man’s transcendence: it is one of those points in which man is in a certain sense ‘destined’ to go beyond himself, and is called to this in a mysterious way.” Suffering reveals man’s relationship with the transcendent; it is a moment in which we can discover again our foundational openness to God as we turn outwards in search of answers. The primary experiences that come to the fore when we suffer physically are those of vulnerability and dependence. In a moment of sickness our bodies remind us of our fragility and the precarious nature of our existence; they stir in us (whether this is explicitly conscious or not) the realization that we do not hold ourselves in being; we are not the source of ourselves; they cause us to question, to wonder; and this is what makes human suffering unique. This experience corresponds with “original solitude” in which John Paul II expresses how man discovers himself as unique in creation; he is a being capable of wonder, capable of a relationship with God. Suffering is a moment that makes it possible for us to rediscover this foundational openness to God. A second moment in the experience of physical suffering is that we come face to face with our need for others, whether that is our need for the skills, expertise and care of our physicians and nurses, or the love and support of our families; we cannot escape the fact that we depend on others. We are broken open as it were from the inside, and in discovering our dependence on others we learn that we exist, not as isolated individuals, but in relation. This discovery is encompassed in what John Paul II calls “original unity,” in which he saw how the creation of humanity is only complete in the unity of the two, male and female; and so the human person discovers himself already existing in relation to another and can only fully understand himself in such a relation of unity and difference. What is more, the nature of this relation is also revealed in a third element at play in suffering, which is the response of those around the one who is suffering – the environment in which he is received. Since the only truly human response to suffering is one of com-passion, in which we reach out and care for the one who is suffering, and even choose to suffer-with him, this relation should emerge as one of love. This corresponds with John Paul II’s concept of “original nakedness,” by which he understands the body to reveal the nature of man’s relation to the other and to God as one of love, since the male and female bodies are ordered towards a mutual self-giving that is fruitful. As José Granados writes in his article entitled Towards a Theology of the Suffering Body, “What is revealed about the body in suffering is its openness to the world in the form of vulnerability. This openness guides us to solidarity with our fellow men: the body becomes a place of communion, by means of compassion (from the Latin compati, ‘to suffer with’).” Suffering draws us into community, and the response of this community to the spectacle of suffering mediates meaning to the one who is suffering. For, if our dependence and vulnerability are met with genuine compassion and care, we can realise that we still are valued because, even in our brokenness and frailty, we have an innate dignity and worth. It is possible to explore this “language of the body” further through one particular response to suffering that appears in palliative care, and to propose, not just a “language of the suffering body,” but also a “language of the dying body.” Such an exploration is greatly enhanced by the work and writings of Dr Cicely Saunders, pioneer of palliative care and founder of the modern hospice movement. Saunders has a particular voice in any discussion about medicine and suffering and a contribution of considerable weight, because she chose to live alongside the most vulnerable and dependent patients we can meet: the dying. The fullest response to the “why?” of human suffering, then, comes not through words or explanations, but through gesture, through presence. To remain, even when there appear to be no more answers, is itself the beginning of an answer. For in remaining we are acknowledging the goodness of the suffering person’s very being, we are receiving them just as they are, we are saying simply, “You matter because you are you and you matter to the end of your life.” And from within this response of presence, of being received, it becomes possible for the suffering person to face the deepest truths that the experience of suffering brings to the fore. In this way the discovery that I am not source of myself can be transformed into the discovery that there is One who is my source. The paradox of the language of the dying body is that just as life seems to be being taken away, it is possible to discover that it was given in the first place. And if life is given, then there must be a Giver – One who stands at the foundation of life and to whom we can return the gift of life in as act of gratitude. This means that man has an origin, and so he has a destiny: he is a being-from (God and others) and a being-for (God and others). The whole hermeneutic of gift that John Paul II proposes in Theology of the Body is laid bare. Medicine, then, as the discipline directly engaging with the question of physical suffering, unavoidably participates in all the questions revolving around the experience of suffering, and does so directly through the body. In one way this places medicine in an advantageous position, because it always has before it the witness of the suffering body, which points to fundamental anthropological truths. However, we have to ask whether modern medicine, permeated as it is by the secular anthropology of Western civilization, is capable of recognising this witness of the body or of hearing the language of the suffering body. We do not expect medicine to solve the mystery of suffering, but we do need it to respect the truths reflected to us by the experience of suffering, and to work within a framework that corresponds to that experience. Do we find such a correspondence within contemporary medicine? Without it, put simply, medicine will not be able to meet suffering and this, in turn, will contribute to an intensification of suffering. In an attempt to open up this question of suffering for continued discussion, and without claiming to address all the anthropological issues involved, three main areas will be briefly proposed for exploration. These have been chosen because they come to the fore within the clinical setting, and they give a clear illustration of principles of secular anthropology at work in contemporary medicine which directly impact how medicine engages with the reality of suffering. The first of these is how medicine approaches the body. It is immediately evident that medicine operates according to mechanistic principles when it deals with the human body. The body is conceived of as an intricately connected collection of parts or organs which can be treated separately, or even taken out to be fixed and replaced. The body in effect is a machine, an artefact, in which the whole is simply a group of parts whose unity is a matter of organisation. The difficulty is that this approach to the body, in which it becomes a machine or a tool we employ in order to exist, stands in direct conflict with the experience of the body that the patient is going through. It is precisely when we are suffering that the usual “transparency” of our bodies is obscured and we become acutely aware that we do not have a body, we are our bodies. We know that we never meet a body, we meet a person; we never see an organ, it is always someone’s organ. This might seem obvious, and we could say that if we are healthcare professionals worthy of the name we would always seek to promote person-centred care that respects this reality. The question we need to ask is why is it a struggle to do that in our modern healthcare system? Moreover, if we are serious about the unity implied in a true “person-centred care,” then we should follow this through and explore the fact that human biology is always a personal biology – which is to say that the unity between the body and soul is radical; the soul is informing the body from within. Such a discussion would be extremely difficult in modern medicine, because materialistic principles mean that the body must be nothing but matter, and matter cannot have any meaning. The patient’s experience of suffering can have no unity. The second area necessary to any discussion about medicine and suffering is the question of health, since in seeking to relieve suffering, medicine aims to restore health. Traditionally health has been understood as wholeness; the word comes from the same Indo-European root as the words “heal,” “whole,” or “holy.” So healing is about restoring unity and relation in something that is broken or divided. However, if the body is just a collection of parts inside parts, then health has simply to do with the organisation of these parts. A purely technological approach to health cannot see that health is a harmony that is not produced by the interaction of mechanical parts manipulated by a physician’s activities. What is more, modern medicine, by approaching the body as a collection of parts inside parts, in fact imitates dis-ease, which is itself characterised by division and disintegration. We separate the person from fundamental relationships which have an integral part to play in their wholeness, in their health: fresh air, good food, sound sleep, family, and friends. This might be necessary for a time, for some technical reason, but we have to accept that this will not lead to healing. Patients themselves articulate this reality to us in phrases such as, “I need to get home to get well,” or “I’ll get some rest when I get home.” This should lead us to ask, is “healing” in the fullest sense a realistic aim for modern medicine? Should we not acknowledge that the most we can offer is to “fix” people? And if this is so, we must acknowledge that suffering is a much greater question than medicine can address, and perhaps medicine has something to learn from suffering? This isolation of the person is one of the biggest challenges of our time, and crystallizes around the question of suffering. We have discussed how the experience of suffering forces us to face our need for others and our dependence. Each patient we meet is in the midst of this experience, and is going through that in an environment and a system that, at every level, has no recognition of “relation.” There is frequently poor communication between the diverse teams dealing with patients’ different symptoms or organs. We are taught to stay “professional” and not become too involved with our patients. In the acute setting patients feel this isolation from relation at a practical level in visiting times needing to be strictly limited and facilities for families and friends not being a priority. On-going financial aid, care structures in the community and rehabilitation programs focus solely on the individual in isolation. A young mother (known to this writer) paralyzed by a spinal injury, and immersed in our modern medical system for seven months, found eventually that in order to articulate to those working with her towards rehabilitation at home the way she wished to live family life with her husband and her children, she needed to say, “I do not want to be independent. I want to be inter-dependent.” The key to living with suffering, as this mother found within her very profound experience of dependence, comes in relation, in community. Suffering is only intolerable when no one seems to care. By approaching the person as an isolated individual we should ask: does medicine in fact leave people alone in their suffering? And if so, does it thereby make their suffering worse? How then, in the light of all these points for discussion, does contemporary medicine understand suffering? Suffering is experienced as something that challenges and threatens our existence. We have discussed how it draws us into the fundamental questions about reality (“Who am I?” “Who is God?” and most significantly “Why am I suffering?” and “What does this mean?”) – how it may offer a moment of transcendence. Contemporary medicine attempts to respond to that moment according to a reductive and secular anthropology that excludes the question of God and the transcendent from the outset. This has a number of interrelated consequences for its understanding of and engagement with the question of suffering, and we meet these consequences in our clinical practice. Within a framework that excludes the transcendent, this life appears to be the only life we have, and so it must be preserved at all costs. Anything which threatens life ought to be fought and overcome, and so the eradication of suffering becomes the pressing goal of our culture. Of course, at one level this is an honourable objective, since to relieve suffering is and ought to be a pursuit of any truly humane society. Yet, there is a world of difference betweenalleviating suffering and eliminating suffering. The modern ideal of progress means that we are striving for a world without suffering – and that we expect to be able to achieve this. This means that all those we cannot hope to cure – the chronically ill, the disabled, the dying – become, to varying degrees “hopeless cases.” We cannot hope to fix the situation in which these people find themselves; our technological methods fall short of the reality placed before us. What is more, the suffering experienced in such situations is precisely what a secular anthropology does not want to face. The “hopeless cases,” more than any other, remind us of the transcendent aspect of suffering and of the human person, for it is these situations which cause us to ask “why?” and so to seek beyond ourselves for an answer. Within a secular anthropology this question “why?” is unbearable, because we have no one to whom to address it. We have made God absent. Hospices and the hospice movement exist within our healthcare system as places where we can glimpse again the hope present in the “hopeless cases.” The decision to remain with patients as they face their final journey on earth allows hospices to become places of true healing; paradoxically, a wholeness is recovered precisely at the moment of disintegration or brokenness. The principles of palliative care, which were born within a Christian anthropology, give rise to an atmosphere and an attitude to the suffering person that resonates with people at the level of their experience. Patients frequently say they feel “safe” in the hospice, even though they might know that they are dying. If it is not possible for them to be cared for in their own homes, they are always reluctant to be sent to any other kind of care institution. Families regularly comment on the peace and the joy present in the hospice, and how the care their loved one receives helps ease the pain of losing them. As one son said to the nursing staff, after his father was admitted to a hospice and made comfortable enough to spend the last three days of his life singing and laughing with his loved ones: “You gave him back to us.” There is a recognition here (conscious or otherwise) of a model of care that corresponds to the reality of the experience which is being undergone. However, these principles are not unthreatened in our culture, and palliative care is not immune from the secular anthropology at work in modern medicine. We know that there is a strong movement in our culture to control death in a technological way, to silence this final witness of the body to an adequate anthropology. The euthanasia lobby is extremely strong, and in many ways this is because euthanasia is the logical way to deal with death within the framework of a thoroughly secular anthropology. Radical individualism, which understands freedom as a purely self-determining autonomy, means that I should have the right, not only to choose where I die (one of the much-spoken-of principles of palliative care), but also to choose when I die. Dependence and vulnerability can only ever be understood negatively, and the infirm or dying person has no value because they no longer play an active part of our society, contributing to its production; they have no use in society, and so are ultimately a social and economic burden. We need to ask, is there anything in the logic of our culture that prevents it accepting euthanasia? It seems, then, that the needs of the suffering, and particularly those of the “hopeless cases,” are being met in our society in pockets where a true anthropology is being held on to and lived; they are not being met according to the principles or logic of our culture, and they cannot be. True compassion and a respect for the person occur within modern healthcare despite the system, and it is a struggle to allow them to occur. It is one of the great privileges of working in this discipline that we witness every day, in the words and gestures of our patients and colleagues, beautiful examples of true humanity shining through the experience of suffering, almost in defiance of the impersonal structures which our systems have imposed upon us. Suffering and death are the stumbling blocks for secular anthropology, and so it is that medicine finds itself in a precarious position of privilege at the front line of a conflict. Each time we meet someone who is suffering, we are present in an encounter where two world-views are colliding. On the one hand, we have the reality of the experience of suffering and the truths about the human person which this experience reveals to us (truths which open us to, and are only adequately responded to from within, a Christian anthropology). On the other we have the principles of our culture, which has rejected these truths. This collision is happening within the person in front of us, and it will vary depending on their own life experience, decisions, and beliefs. However, we are involved in this collision too, and if we remain alive to the language of the body and the call of suffering, this will mean that the experience of suffering is transformed for the sufferer and we too are transformed. The “why?” of suffering is only bearable within an encounter marked by compassion, and it is such an encounter which recovers for us the horizon of meaning which is love – the only horizon against which our own life is worth living. In this way, we learn that the real work is not ours at all, for, as Saunders puts it, “the Christian answer to the mystery of suffering and death is not an explanation but a Presence.” We love because we are first loved, and our call, or vocation, is to become mediators of that Presence to those whose lives we touch. 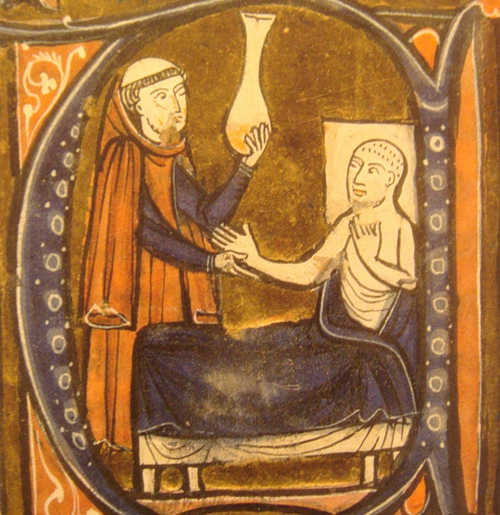 Medicine, then, if it is going to meet suffering at all will do so person-to-person. There is no other way. Granados, “Towards a Theology of the Suffering Body,” Communio 33 (Winter 2006), pp. 552-53. This approach, examining man’s experience in order to find meaning, presupposes a synthesis between the corporeal and the spiritual in which the human body, united to the soul, stands as the bearer of a primordial meaning that it communicates within man’s experience of life. See Anderson and Granados, Called to Love, Approaching John Paul II’s Theology of the Body (New York: Doubleday, 2009), pp. 37-38, and Granados, “The Unity of the Human Person under the Light of Love,” Melina and Anderson (eds), The Way of Love: Reflection on Pope Benedict XVI’s Encyclical Deus Caritas Est (San Francisco: Ignatius Press, 2006), pp. 91-106. Granados, “Towards a Theology of the Suffering Body,” Communio 33 (Winter 2006), pp. 540-63. Saunders, “Watch with Me,” Watch with Me: Inspiration for a Life in Hospice Care, 2nd edn (Lancaster: Observatory Publications, 2005), pp. 3-8. Saunders, “A death in the family: a professional view,” British Medical Journal, 1(844) (1973), pp. 30-31. Granados, “Towards a Theology of the Suffering Body,” Communio 33 (Winter 2006), p. 556. We might ask whether we really want medicine to deal with suffering. When I go to the physician with severe abdominal pains because I have appendicitis, I don’t want a discussion about my vulnerability and dependence and my need for God; I want a correct diagnosis, a quick transfer to a clean and comfortable hospital, an excellent surgeon, caring nurses and a speedy discharge home. However, I also need to know that the professionals, to whom I am entrusting my life, have my “best interests” at heart. Precisely what these “best interests” are imply the whole anthropology at work in modern medicine, which may or may not be true, and which will come forcefully into play should anything go awry during my hospital stay, requiring major ethical decisions. Berry, “Health is Membership,” The Art of the Commonplace (Washington, DC: Shoemaker and Hoards, 2002), p. 145. Granados, “The Body, Hope, and the Disclosure of the Future,” Communio 36 (Winter 2009), p. 653. Kass, Toward a More Natural Science: Biology and Human Affairs (New York: Free Press, 1985), p. 300. Granados, “The Body, Hope, and the Disclosure of the Future,” Communio 36 (Winter 2009), p. 657. Berry, Wendell “Health is Membership,” The Art of the Commonplace, p. 155. Kass, Toward a More Natural Science, p. 205. Anderson and Granados, Called to Love: Approaching John Paul II’s Theology of the Body (New York: Doubleday, 2009), p. 108. Frederico Lombardi SJ, Vatican Press Office, 11/02/10. Berry, “Health is Membership,” The Art of the Commonplace, pp. 144-58. Saunders, “Facing Death” Watch with Me, pp. 19-30.